Payday Tool is a highly untrustworthy program; however, many users do not think that it is unreliable because it promises to enable them to “find top payday loan lenders”, “browse payday options for free, and “get information on payday loans from your desktop.” Even though Payday Tool looks like a beneficial program at first sight, you should definitely not keep it installed. One of the main reasons why we do not recommend doing that is the fact that Payday Tool might cause harm to your system very quickly. Users who want to prevent this from happening have to delete Payday Tool immediately. We promise to tell you everything we know about its removal in this article, so you just need to read it from beginning to end. The first thing that Payday Tool will do after you launch it is to open a legitimate website acecashexpress.com/payday-loans. In addition, you will see a browser window with all kinds of offers. These are activities you can see; however, Payday Tool might perform different activities behind your back too. Specialists at pcthreat.com have found out that this program might collect all kinds of information about you and then send it to third-parties. It will use the collected data to send you commercial text messages in the future, and you might see ads on your screen while surfing the Internet too. It has been observed that it mainly gathers such data as IP address, mobile telephone number, fax number, payment information, social security number, health information, and anonymous user data. As you can see, it records many different details, so there is a risk that your privacy will be violated. It is up to you what to do with Payday Tool; however, if we were you, we would definitely delete this advertising-supported application (adware) from the system. If you have installed Payday Tool on your computer, there is a huge possibility that you have Opera Browser, Amigo, Sweet-Page, MyPCBackup, and other undesirable programs on board. 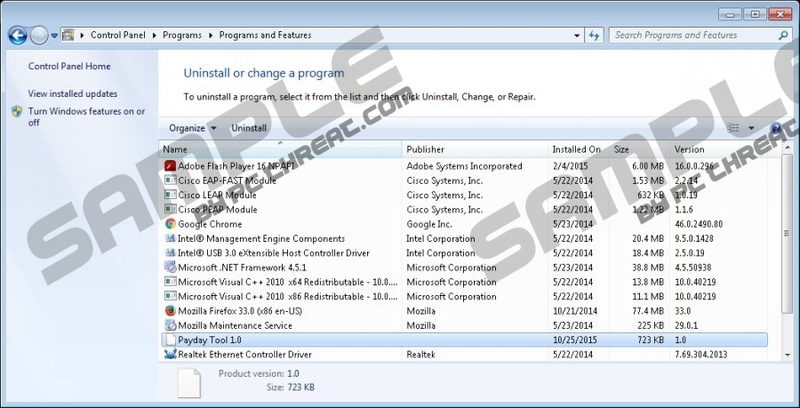 The majority of these programs are unreliable, so you should detect and delete them too. You should scan your system with the SpyHunter diagnostic tool (it can be downloaded from this website) no matter you have installed Payday Tool consciously or it has entered your system without permission because additional applications might have been installed alongside it in both cases. SpyHunter will enlist all the threats that exist on your PC in the blink of an eye. Luckily, Payday Tool itself can be deleted via Control Panel. Unfortunately, we cannot tell the same about the additional programs that have been installed on your system as well. Therefore, we highly recommend removing untrustworthy software automatically, i.e. you have to acquire a security tool and then scan your system with it. We recommend using SpyHunter because we know that it will do what it has to do. On top of that, it will protect your system from similar applications. You should not download and install Virusit and Coupon Navigator programs yourself too because they are almost identical to Payday Tool and might also cause harm to your system very quickly. Right-click on Payday Tool and click Uninstall. Right-click on the lower-left corner. Select Control Panel from the menu and then open Uninstall a program. Enter Control Panel into the search box which you will find on the Taskbar. Tap Enter and then go to Uninstall a program. Quick & tested solution for Payday Tool removal.